Galilei was born in Pisa in 1564, the son of Vincenzo Galilei, well known for his studies of music, and Giulia Ammannati. He studied at Pisa, where he later held the chair in mathematics from 1589 - 1592. He was then appointed to the chair of mathematics at the University of Padua, where he remained until 1610. During these years he carried out studies and experiments in mechanics, and also built a thermoscope. He devised and constructed a geometrical and military compass, and wrote a handbook which describes how to use this instrument. In 1594 he obtained the patent for a machine to raise water levels. He invented the microscope, and built a telescope with which he made celestial observations, the most spectacular of which was his discovery of the satellites of Jupiter. In 1610 he was nominated the foremost Mathematician of the University of Pisa and given the title of mathematician to the Grand Duke of Tuscany. He studied Saturn and observed the phases of Venus. In 1611 he went to Rome. He became a member of the Accademia dei Lincei and observed the sunspots. In 1612 he began to encounter serious opposition to his theory of the motion of the earth that he taught after Copernicus. In 1614, Father Tommaso Caccini denounced the opinions of Galileo on the motion of the Earth from the pulpit of Santa Maria Novella, judging them to be erroneous. Galileo therefore went to Rome, where he defended himself against charges that had been made against him but, in 1616, he was admonished by Cardinal Bellarmino and told that he could not defend Copernican astronomy because it went against the doctrine of the Church. In 1622 he wrote the Saggiatore (The Assayer) which was approved and published in 1623. In 1630 he returned to Rome to obtain the right to publish his Dialogue on the two chief world systems which was eventually published in Florence in 1632. 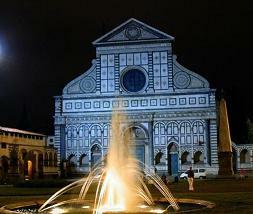 In October of 1632 he was summoned by the Holy Office to Rome. 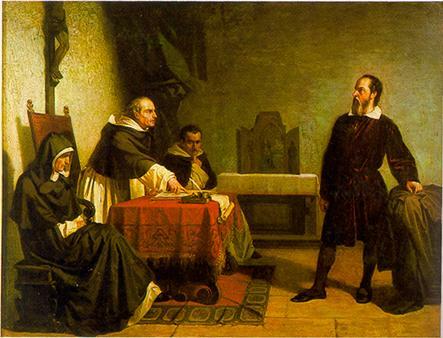 The tribunal passed a sentence condemning him and compelled Galileo to solemnly abjure his theory. He was sent to exile in Siena and finally, in December of 1633, he was allowed to retire to his villa in Arcetri, the Gioiello. His health condition was steadily declining, - by 1638 he was completely blind, and also by now bereft of the support of his daughter, Sister Maria Celeste, who died in 1634. Galileo died in Arcetri on 8 January 1642. For the family of Galileo, see the genealogical tree. Within the Museo, Sala IV is entirely dedicated to Galileo and his studies; among other things are preserved the lenses, the inclined plane, the lodestone, the model of the application of the pendulum to the clock, several portraits and a relic. Galileo GALILEI - Mechanics. The contributions made by Galileo to mechanics remain fundamental, despite the fact that this field of research met with less interest from the Medici Grand Dukes than Galileo's astronomical discoveries, perhaps because it was less spectacular. Galileo's investigations concerned the natural descent of bodies along planes of various inclinations, the formulation of the law which established the relationship between space traversed and time interval in free-fall, the isochronism of the oscillations of pendulums of equal lengths and, of particular importance, the motion of projectiles. At the end of the eighteenth century, from the necessity of displaying some of the mechanical principles discovered and demonstrated by Galileo, the Florentine Museum of Physics and Natural History had experimental devices constructed, such as the model of the inclined plane, the brachistochrone descent and the machine for raising water. 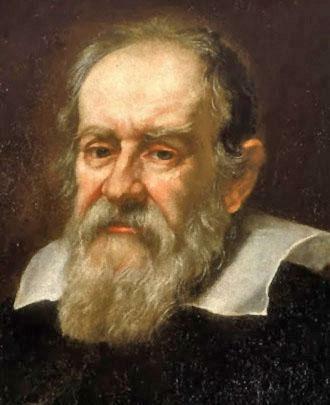 Galileo GALILEI - Astronomy. The observations of the sky which Galileo carried out with his telescope led to the discovery of the satellites of Jupiter and to Galileo's increased adherence the Copernican System. The phenomena which were revealed little by little due to the increased possibility of larger lenses were described and illustrated by Galileo in Sidereus Nuncius. The periods and frequencies of appearances of the satellites of Jupiter were studied by Galileo in order to develop a method for determining longitudes at sea. Galileo GALILEI - The microscope. In the early years of the seventeenth century Galileo adapted a telescope for the viewing of extremely small objects. Between 1619 and 1624 he began to produce microscopes or "occhialini" as he called them. The Galileian microscope is made up of the tube of a telescope, of reduced size, furnished with two lenses. Galileo gave his "occhialino" to various people. He sent a letter to Federigo Cesi, accompanying the instrument, in which he explained the means by which it was focussed and the arrangement of objects for observation. Galileo GALILEI - Thermometry. Viviani recounts that Galileo dedicated himself to research on heat at the end of the 16th century. The invention of the thermoscope seems, then, to belong to his Paduan period. This device was used to carry out experiments on the relationship between changes of temparature and variations of the level of the liquid. The work of the Accademia del Cimento which led to the birth of the Florentine thermometer had its origins in Galileo's early research. Galileo GALILEI - Magnetism. 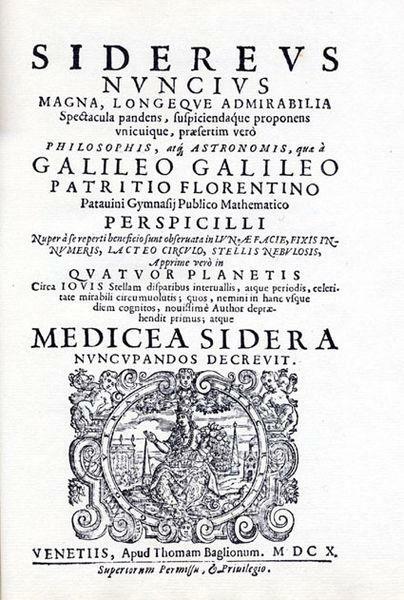 Between 1600 and 1609 Galileo devoted himself to studying magnetism, inspired by William Gilbert's De magnete. He attempted to increase the strength of loadstones by means of special armatures. One of these (IV.8) was given to Grand Duke Ferdinand II by Galileo.